I’m going to deviate from topic here just a bit, if you will allow a small foray into Greek tragedy. I saw the new production of Electra at the Old Vic, starring Kristin Scott Thomas in the titular role on Saturday evening. It is, perhaps surprisingly, the first time I have seen an ancient play performed rather than just reading the text, and that in itself (nevermind the Hollywood status of the lead actor) was quite stunning. Electra, for anyone unfamiliar, is one of the children of the ill-fated marriage of Agamemnon and Clytemnestra. Caught up in the cycle of the Trojan War, her father sacrificed one of her sisters, Iphigenia, at the start of the war so that the Greeks would have a favourable wind, and thus could sail east to besiege Troy. Still distraught over this incident, Clytemnestra and her lover, Aegisthus, killed Agamemnon when he returned from the war. Sophocles‘ version of the play, written in the fifth century BC, picks up a number of years later, with Electra still mourning the death of her father, and hoping for the return of her brother, Orestes, so that they may seek revenge upon their mother and her new husband, who has taken up the thrown of Argos in their father’s stead. Unlike some of the other Greek tragedies that have survived the centuries, there is no real sense of conflict in the character of Electra: she is adamant in her anger, her despisal of her mother and her husband, and focuses on her desire for revenge above all things. Whilst this might seemingly make the play somewhat flat, as there is no possible outcome for Electra other than death – either her’s or that of Clytemnestra and Aegisthus – the tragedy of it is not about the end result, but about the suffering Electra endures. Her grief consumes her almost to the point of madness, and whilst the overwhelmingness of it is clear on the page, on stage it becomes real. The Electra of Kristin Scott Thomas is a manifestation of torment. Her pain, her grief, is tangible, from the moment she walks onto the stage. Though others have seen her intensity, her inability for stillness ,as a bit over the top, I recognised it as the physical outlet of deep emotional suffering, of the kind that makes one tremble merely from the struggle to keep from falling apart entirely. For Electra, the tragedy comes from within, from her battle to cope with the pain others have brought into her life, and the knowledge that once she gets her revenge, she will have nothing left. This leaves no room for the catharsis typical of this type of tragedy, and leaves the audience with as much emptiness as Electra undoubtedly feels herself. I hate to take any credit away from Sophocles, for it is his words that filled the stage (for the most part), but I cannot help but think a lesser actress would not have been able to convey the emotional turmoil, the heartfelt agony of loss and grief, and the physical intensity of mental anguish as readily. 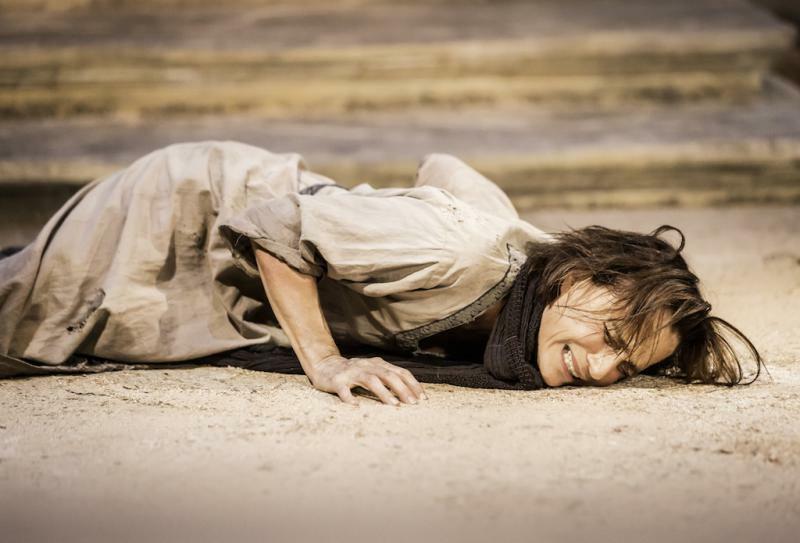 Quite simply, Kristin Scott Thomas is Electra. What voices aren't you hearing? Blogging through my PhD in Roman Religion.